20% OFF last min Sea Pines Rentals. Nature views, contemporary furnishings, and an open floor plan in a relaxing space sums up the benefits of staying at this charming 4 bedroom, 3 bathroom corner unit in South Beach Villas. Very spacious and located near the South Beach Marina this unit offers all the frills, comfort, and convenience for the perfect Hilton Head getaway in Sea Pines Plantation. 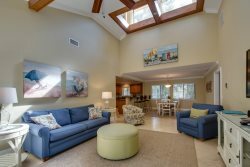 For the perfect home away from home just steps from the beach stay in this spacious 5 bedroom, 3 bathroom house in the historic Sea Pines Plantation. Fourth row from the beach, with a large private pool; this home has everything your family needs for some fun in the sun! an endless supply of water activities, Championship Golf courses, and much more! to make you Summer Vacation a lifelong memory!